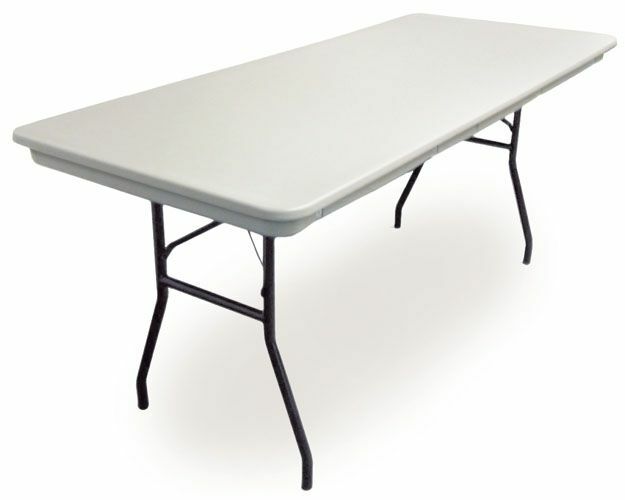 This industrial strength blow molded plastic folding table is one of the strongest, lightest, most affordable indoor/outdoor folding tables on the market! 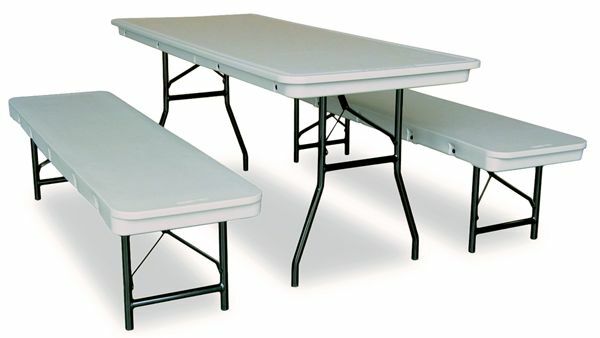 It is a durable heavy-duty plastic table made to withstand many years of use in places such as school classrooms, churches, banquet halls, meeting halls, and almost anywhere else! Along with being extremely durable, the plastic top is stain, heat, and impact resistant, all while remaining easy to clean. The Commercialite Table is great for both indoor and outdoor use because it is also UV inhibited. Storage and transportation are easy with the folding legs and simple design that will fit in many different table trucks. Mainframe constructed of U.S. steel rails and folding legs: rails are roll formed of 14 gauge steel, legs of 16 gauge 1” steel tubing and braces of 11 gauge stamped steel with 16 gauge gravity lock. Legs are permanently swaged into rails then attached to the table top with bolt-through assembly. Frame and tubing are industrially cleaned for rust resistance and superior paint adhesion. Baked on polyester powder coating has outstanding toughness, excellent weathering properties, and a smooth appearance. Blow molded table top of polyethylene plastic with color blended throughout. Formulated for outdoor exposure with minimal fade or thermal stress cracking (indoor storage recommended). The average thickness of material engineered to be .140”. Excellent stacking performance, 15 high maximum is recommended. Edge of the table is 7/8” thick to accept standard skirting clips. Round tables are made with two half circle pieces electronically bonded together. The top is attached to the main frame with bolts and nylon nuts to provide extreme durability and ensure there is no separation during rough handling. 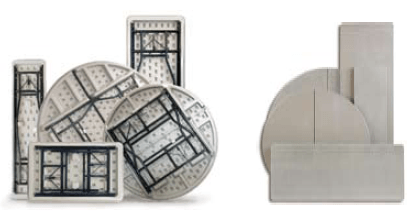 Glides are insert style flush mount standard. Nylon pad on glide for non-marring of floor surfaces. Rivets are ¼”, zinc plated to resist rust and powder coated for complete rust protection. All Commercialite® tables have Gray tops and Black powder coat frame and legs. Full 10 year limited warranty against manufacturing defects under normal use. McCourt Manufacturing will repair or replace (at our option) at no charge; customer assumes all freight charges.